[vc_row css_animation=”” row_type=”row” use_row_as_full_screen_section=”no” type=”full_width” angled_section=”no” text_align=”left” background_image_as_pattern=”without_pattern”][vc_column][vc_column_text]Today we will explain how to play Capture the Flag for those who are new to this game. We will also mix in some variations for those who have played the traditional version before. There will be a general overview of the game concept. Then we will drill down into the details. 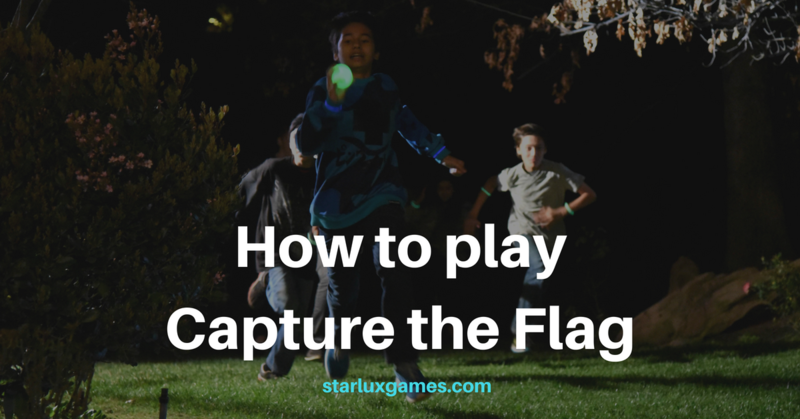 Scroll down to the bottom of this page to watch a video on how to play Capture the Flag. Capture the Flag is a game of defense and offense. There are two teams playing on a divided field. Each team has a flag that they try to protect as the enemy team tries to steal their flag. It is a game of strategy, speed, and even sacrifice. It is not easy to steal the other team’s flag while you are busy defending your own! Players defend against the enemy from the opposing team by tagging them, which sends the attackers to a “jail.” These jailbirds can be freed by their teammates who can rush the jail area and tag teammates, which gives them a free pass out of jail. The game is over when one team captures the other team’s flag and carries it back to their side of the field without being tagged in the process. Simple enough? That is the broad overview of how to play Capture the Flag. See this video for a visual demo. The devil is in the details so let’s dive deeper. Some Capture the Flag concepts are comparable to other sports. In football one team wants to reach (capture) the opponent’s end zone for a touchdown. The opponent must defend their end zone by playing defense. The teams go back and forth on offense and defense trying to get to the goal – the end zone. In Capture the Flag, both teams are on offense and defense at the same time, sort of like basketball. Part of the team is defending and part is attacking. And a defender can turn into an attacker in a split second if he sees an opening. Just like when a basketball defender steals the ball and races to the opponent’s goal for a dunk. Capture the Flag is also similar to warfare. Remember the Trojan War? You know, the one that started when a Trojan prince was crushing on a Greek queen? The goal in that war was to retrieve the queen from behind the walls of Troy. The Trojans were on defense and the Greeks were on offense trying to capture their queen and return her home. Two teams are needed, so divide your group up equally. If you have more than three players on each team then you need a way to designate one team from the other. One team can have blue flags (think flag football) and the other team can have green for example. The playing field is divided in half and marked with a natural border or you can use cones, string, or a line of rocks – be creative. Each side needs a jail area marked off so captured players can be “locked down” until they are rescued or the game is over. Before the game starts, both teams have a chance to hide their flag in their own territory. They can’t put it under objects, but the idea is to put it where it is not easily found. Flags can be actual flags on a stick. Or they can be a frisbee, a ball, or even a towel. Just make sure each team’s flag is marked as their own. You don’t want two flags exactly alike since that would be confusing! The game begins and both teams try to capture the enemy’s flag. It helps to have a strategy before the game erupts. But some teams prefer to wing it. I’d put money on the team that takes time to create a plan. Having certain players be defenders and others play as attackers makes for an organized team. A team with no plan may have too few defenders and lose their flag due to all their players being out of position to protect their flag. In a good game of Capture the Flag, there will be a back and forth battle. Players will be tagged and sent to jail. They will be freed in daring jailbreaks by their teammates. Sometimes stamina plays a role in who wins. Long battles can tire out players. So those in better shape will still be fast after running around for 30 minutes or more. Other times cleverness wins the game. Tricky strategies like the Greeks using the Trojan Horse can be the difference in a Capture the Flag battle. Certainly, teamwork wins many games. Players on the same page are more likely to overcome a team who doesn’t work as well with each other. Planning before the game and communication during the game are the hallmarks of good teamwork. To answer more questions on the micro details of how to play Capture the Flag, and variations here we go. Tagging method – You can use two hands or one. Or use flags like are used in flag football (DIY idea – cut up old T-shirts). When players are freed from jail there needs to be a rule about how they get back in the game. They can either walk back to their turf before continuing or maybe they can get right back into the action as soon as they are free. Decide if flags can be passed to teammates or even thrown if using a ball or frisbee. Once the flag is hidden, can it be moved by the protecting team during the game? You decide and mix variations in to keep the games fresh. More than one flag for each team can be used if there are lots of players on each team like this world record game (video). 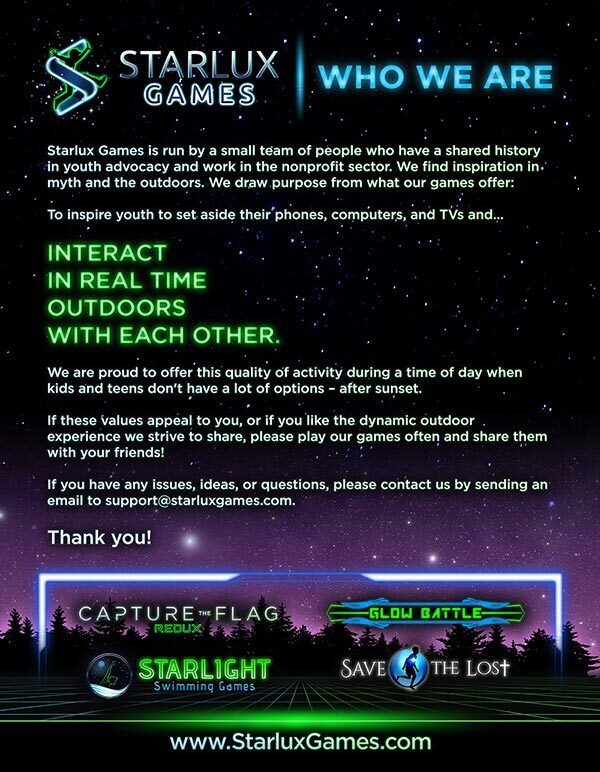 The bottom line with Capture the Flag is comparable to boxing. Hit and don’t get hit! Attack, but don’t forget to defend. The Trojans were good at defense for many years versus the Greeks in the Trojan War. But they let their guard down and ended up losing that war. It was a hot mess with soldiers crawling out of a wooden horse in downtown Troy! Keep that in mind when you and your tribe are playing Capture the Flag. It only takes a few seconds to lose your flag to the enemy. Winning the game takes good offense and a vigilant defense. If you have any more questions about how to play Capture the Flag, please ask in the comments section. It’s a fun simple game, but there are many options and ways to enhance the experience. 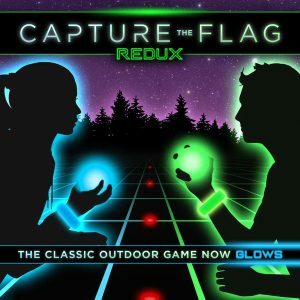 If you enjoy playing Capture the Flag, you’ll love our exciting glow in the dark version that you can play at night called Capture the Flag REDUX.